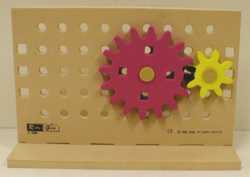 Gear model kits are very useful when learning about gears. 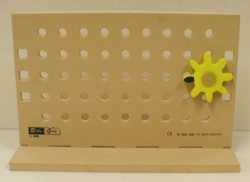 The photographs below show a useful kit made from a soft but rigid plastic material. The parts can be put together without the use of tools and various components are supplied including a range of gear wheels. If you have the same or similar kit, set up the simple gear train shown below and attempt the exercise. 1. Put the back board and base in position. 2. Add the first small gear wheel and rotate it by hand. 3. Add a larger second gear wheel that meshes with the first and spin both gears to check that they rotate. Can you work out the gear ratio (velocity ratio)? The larger gear wheel is the driver and the smaller is the driven. 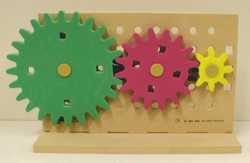 Which gear rotates the fastest, the larger or smaller gear wheel? 4. Add a third gear wheel and spin all three gears to check that they mesh properly together. Rotate the largest gear in a clockwise direction and watch the direction of rotation of the other two. Which direction does the middle gear rotate? Which direction does the smallest gear rotate? 5. Try setting up another gear train using two gears. What is the gear ratio? What direction do the gears rotate?